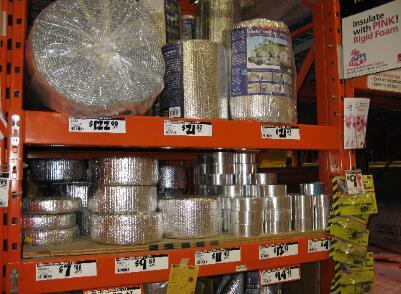 Most large home improvement stores carry what looks like bubble wrap with a metallic foil covering. It is sold as an all purpose insulation and claims to be an effective "radiant barrier". experiment as follows. In the picture below, taken in an unfinished basement looking up at the ceiling, you will see two orange pipes (not the red power line to the left) that carry hot water at 50C / 122F. 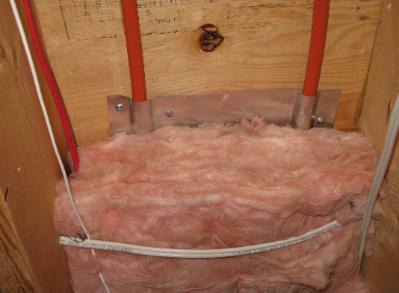 There is an aluminum heat transfer plate that conducts heat from the pipes to the plywood floor. Normally, you would insulate it all with fiberglass. Instead, we will set it up with half fiberglass, and half "radiant barrier" and use a FLUKE infrared thermometer to check the surface temperatures of the bubble wrap and the fiber glass. The fiberglass is in contact with the heat transfer plate. The bubble wrap is separated from it by about half an inch. To compensate for the reflectivity of the foil, we used the low emissivity setting on the infrared thermometer, and also tried some black spray paint. Both techniques work to get an accurate surface temperature reading on the shiny surface of the bubble wrap/foil product. However, there is something not right here. 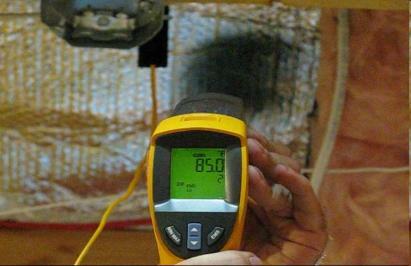 That 85F reading is ten degrees higher than the (R-12/RSI 2) fiberglass insulation beside it. It will simply heat up the air space between the joists and convection (hot air currents) will transfer lots of heat to the basement ceiling. Furthermore, any benefit from the reflective service will be reduced as dust settles on the shiny surface. 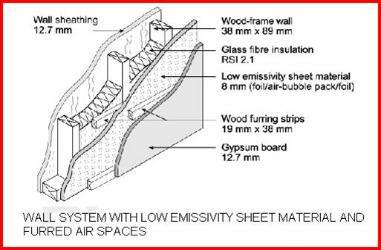 In this study they created a wall as in the diagram below, which had an extra layer of bubble/foil separated by airspaces, and tested the insulation qualities of the wall. In the next study, under slab (cement floor) insulating materials were tested, including bubble pack insulation. Conclusion - "bubble-pack insulation had a low insulating value compared to the polyurethane panels and the XPS board. It’s cost benefit was the poorest of all insulating materials tested. 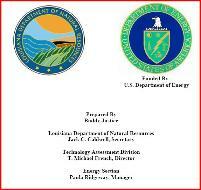 "in Louisiana. We compared the power required to maintain the same temperature conditions in three identically constructed structures." Here is a great web site (non profit) called Health Heating that has a lot more on this topic.